Google released its new badges feature last week, which is supposed to encourage people to visit and share sites they find interesting via the Google+ social network, "which in turn will increase traffic to those sites," according to the official Google News Blog. A user is awarded badges for the amount of reading they've accomplished in a given category. Beginning users receive Bronze, then move up to Silver, Gold, Platinum and finally, Ultimate. The badges are different from Google's News categories in that they represent what you actually have read, rather than what you want to read. They are a fossil of your reading habits, rather than a roadmap to what you might want to read. They're also more tailored than Google News categories, which break everything into just six chunks--World, U.S., Tech, Sports, Health, Entertainment, Spotlight, and Science. The badges are private by default--a refreshing turn from Facebook's public-until-you-make-it-private approach--and have currently only been released in the United States. The badges have two objectives: First, they are meant to improve the individual reading experience on Google News. By providing users a detailed blueprint for what they read, the badges allow the user to better personalize their news page, enhancing the reading experience and potentially the amount of time spent reading news--as well as supporting ads. 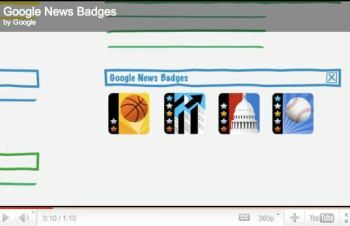 Google 'gamifies' the news with badges. Second, Google hopes the badges will serve as a conduit and organizer for content sharing across Google+. And while a handful of bloggers have already poked fun at the badges as an infantile feature, they are missing the tremendous implications they hold for the nascent social networking site. Consider, for example, how content is shared across Facebook; it's a crazy free-for-all. Sure, you can post in groups or business profiles, but the vast majority of content is shared without any organizational structure behind it. If I post something to my status, a friend cannot discern if I'm well-read on the subject, find other friends who are also well-read on it, or follow that category to related content. In other words, it's an isolated post, being shared by a user who has no way of demonstrating expertise. Google Badges will add some much needed organization into this mess. The new badges also have some implications for businesses. First, businesses that create content to draw traction for their company will have to be more cognizant of how they are publishing, because the new badges break content up into smaller pieces than Google's News categories. Of course, this isn't widespread yet, but with the user base of Google+ exploding, chances are many of these same users will start using badges to organize and share content. That means companies will have to figure out how to get their content into popular badges. Second, companies and freelancers sharing content to draw attention to their product or service will have to, or should, gain a high level badge in their appropriate topics, which will demonstrate credibility. If badges catch on, it's going to become increasingly easy to spot spammers simply looking to promote a brand without any knowledge of it. Authentic businesses (and individuals behind them) will get a credibility boost by displaying their high-level badges. Google badges, if they stick, are going not only to help us organize and share content, but will provide a degree of much-needed transparency. No other social networking site does this. Even Twitter, with which experts can amass thousands of followers by branding themselves "experts" on a given topic, has no way to legitimize a person's knowledge on a given topic. Of course, the quantity of articles read doesn't alone authenticate a person's knowledge about a given subject. But it does get us one step closer to a place where expertise can be qualified. And in the crazy circus of content sharing on the modern Web, that's good news for users and business alike.